We could be ushering in a new era in robotics. Jia Jia’s eyes freely scanned the audience as she stood in traditional Chinese garb for financial services company UBS’s economic conference in Shanghai this week. As demonstrated, she could recognize faces and learn things. Her conversational skills shone as she talked about the weather and coyly rebuffed personal questions. Her face was expressive — or, at least, as expressive as a robot’s face could be. 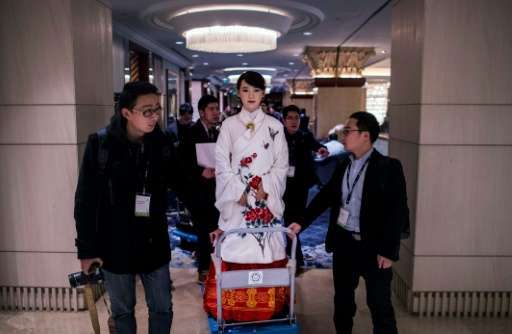 Around the world, Jia Jia has grown in popularity for being one of the most attractive, life-like humanoid robots ever created. But beauty, as they say, is only skin deep. As impressive as Jia Jia’s aesthetics are, it’s what’s inside that counts, and while her artificial intelligence (AI) isn’t extraordinarily great, her current ability to address audiences and answer simple questions is a testament to the progress made by engineers from the University of Science and Technology of China. Chen Xioping, leader of the team that created Jia Jia, believes their achievement stands as proof of China’s robotic future. Instead of relying on a human workforce, humanoid robots could take over essential tasks in nursing homes, hospitals, households, and restaurants, he claims. “In 5 to 10 years, there will be a lot of applications for robots in China,” Chen said during the presentation. Chen believes that humanoid robots will start ushering in a new wave of robot labor, and he’s not too far off. It’s important to note, however, that applications for these humanoid bots will extend well beyond the service industry. Just last year, NASA’s Robonaut 5 (R5) was donated to MIT’s Computer Science and Artificial Intelligence Laboratory (CSAIL) to explore how robots could assist, or even replace, human astronauts on extreme space missions. Meanwhile, Boston Dynamics’ Atlas, which stands at a height of 1.6 meters (64 inches), can open doors, lift boxes, walk on uneven terrain, and detect changes to its environment in real time. Granted, it’s not as pretty Jia Jia, but it’s capable of a wider range of movements. Speaking of agile robots, a DARPA-funded team called DURUS created a robot that moves just like humans do. At this year’s CES, Hanson Robotics introduced Professor Einstein, a prototype that features life-like expressions, demonstrating a breakthrough in how humans could interface with computers in the future. Soon, we may find ourselves interacting with robot physicists and bots like Jia Jia with the same casualty that we currently stare at our smartphones.